There is a great Ethiopian restaurant very close to our house and my husband and I eat there on a regular basis. So I decided to make some of our favorite dishes at home. I even tried making Injera Ethiopian flatbread the traditional way using Teff flour, but that turned out to be a gummy disaster. I will give it another try, but in the meantime, I will keep purchasing it from the restaurant. Actually, the family who owns the restaurant could not believe that I even tried making it at home because they know how difficult it is to make. I know you're thinking that this looks complicated and time consuming. But it's really easy to prepare. The main dish that I'd like to focus on is the Yemisir Wot (front and center), translated as Red Lentil Stew. One of the main components of this dish is an African spice blend called Berbere. I have tried a lot of different Berbere recipes, and some are so incredibly hot that the heat can over power the dish. This recipe however has a nice balance of heat from the chilies and sweetness from the paprika. 1/2 cup ground dried red chilies. I used Chile de Arbol peppers, stemmed and seeded before grinding in spice grinder. You can also use ground cayenne pepper, but add it in small increments until you get the right heat. In a 3qt sauce pan, heat canola oil on medium heat, add onion and cook until soft. Add garlic, ginger and Scotch bonnet and cook for another two minutes. Add 3-4 tsp of Berbere, turmeric, salt and stir to combine. Add tomato puree, coconut milk and 1 cup of vegetable stock. Add lentils and bring to a boil and reduce to a simmer for about 30-40 minutes until lentils soften and mixture thickens. Stir frequently to avoid lentils from sticking. If mixture gets too thick add additional stock and reduce. You want the consistency of the stew to be like loose mashed potatoes with most of the liquid adsorbed, but still creamy in texture. Check for salt and add more if needed. 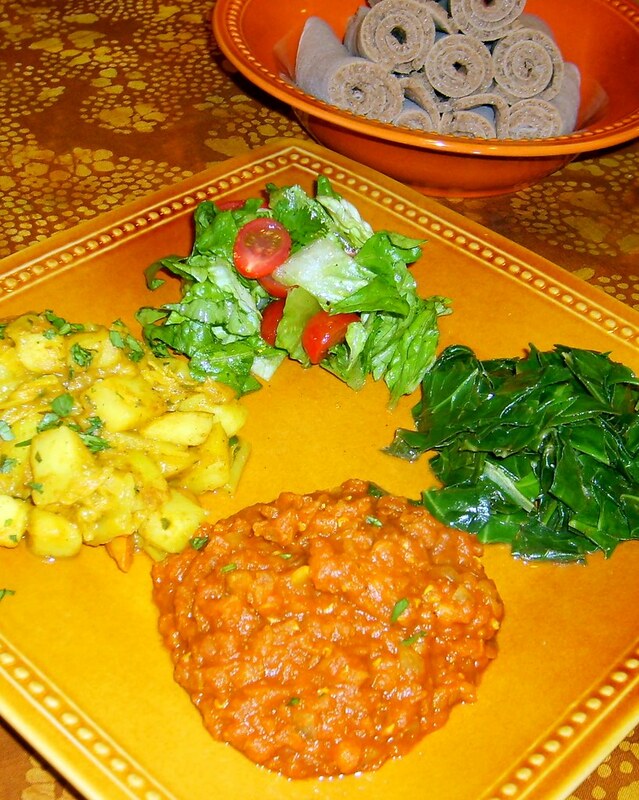 Serve with Injera flatbread, whole wheat lavash or pita. Gomen Wot: Braised collard greens. I make mine with olive oil, minced garlic and lemon juice. But you can also add minced onion and turmeric. Yatakilt Wot: Braised potatoes, cabbage and carrots. I season mine with turmeric, whole coriander seeds, and top with minced cilantro. Tomato Salad: Sliced cherry tomatoes, romaine lettuce, minced jalapeno tossed in a red wine vinaigrette.